Baltimore Ravens tight end Benjamin Watson wasn’t looking to go viral on social media. But more than 850,000 people “liked” the raw emotion he shared in a 2014 Facebook post about racial strife in America. The NFL player’s honest conversation about the division between races connected with people. They shared his post more than 460,000 times and tens of thousands of people left comments. From that post a book was born: Under Our Skin: Getting Real About Race—and Getting Free from the Fears and Frustrations that Divide Us by Benjamin Watson with Ken Petersen. Watson, who won the 2005 Super Bowl while playing with the New England Patriots, was at the Billy Graham Library Saturday in Charlotte, North Carolina, to sign copies of his first book. Which is pretty cool, considering his dad, a pastor, prayed to receive Christ while watching Billy Graham preach on TV. Dozens of people waited in line to meet Watson and get their copy signed. For many, it was exciting to hear and support an NFL player who’s not afraid to talk about race. Or to put his faith out there. “As believers, we have this book called the Bible that we need to filter all these ideas through. even the concept of race,” Watson said on Saturday, sounding much like a preacher. 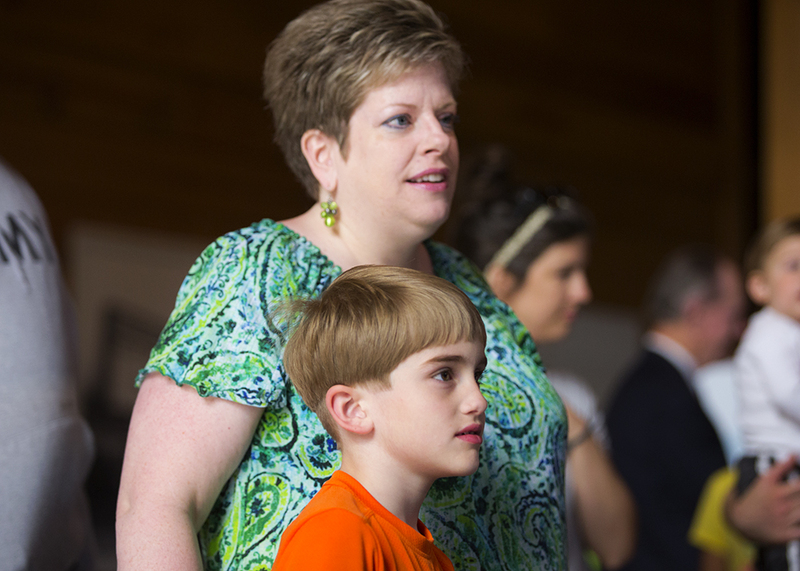 Waiting their turn, Julie Adkins and her football-toting son were new Benjamin Watson fans. Julie had never heard of him until he spoke about racial unity on a recent radio broadcast. She felt an instant connection. Julie Adkins and her son wait to meet Benjamin Watson and show their support for his stand on racial unity and his Gospel worldview. Julie, too, has a burden to see people of different backgrounds come together and talk, and has since she was a teen. She’s also on board with Watson about the role faith plays in the nation’s healing. “As a Christian, I feel like the church is the only hope. “I think [racial reconciliation] has got to be a God thing,” she said, noting the courage it took for an NFL player to take a strong stand for Christ, and to get people talking honestly about their fears and true beliefs about racial relations. In his 2014 post and also in his book, Watson wrote about his feelings of anger, frustration, fear, sympathy, confusion, hopelessness and hopefulness, among others. Watson couldn’t ignore the irony of how God used him—but not in the way he expected. Thinking his claim to fame would be as an NFL tight end, Watson was amused when God had another plan—through his 2014 Facebook post. “And [then] I’m known for a tackle on—really defense, because it was an interception—in a Facebook post. “And I’m like—God’s got jokes. “I know beyond a shadow of a doubt that it was Him. … The Gospel is the equalizer that promotes unity,” said Watson. Since his now famous post, Watson continues to use social media and his blog as a platform for sharing hope through the Gospel. He writes about life’s issues as he sees them—through a Gospel-centric worldview—supporting traditional marriage, the sanctity of life, and persecuted Christians throughout the world, among other things. And when it comes to faith and racial unity, Watson puts it all out there. He uses his platform to talk about both and runs with it. What is this Gospel that Benjamin Watson talks about? Find out here.